The Sufi Sheikh and head of Ghousul Alam Mehboob e Yazdani Sayyid Sultan Makhdoom Ashraf Jehangir Simnani shrine of Kichocha Shareef has departed this life, may his mystery be santified, qaddas sirat'ul aziz. Sheikh Sayyid Muhammed Izhar Ashraf the eldest son of Sayyid Shah Mokhtar Ashraf Sarkar E Kalan al-Ashrafi al-Gilani passed away at 11:45 pm on Wednesday February 22, 2012. He was the Chief Patron of the All Indian Ulama and Mashaikh Board (AIUMB) and a Sufi Islamic scholar of international reputation leaving thousands of his followers in deep mourning. He was 78. He was under treatment at Ismailia Hospital in Mumbai and he drew his last breath there. Sayyid Muhammed Izhar Ashraf's Salat ul Janaza (funeral prayer) was led by his elder son and President of AIUMB, Sayyid Mehmood Ashraf. on February 24, 2012 at Kichocha Shareef, in Ambedkar Nagar district of Uttar Pradesh, in the presence of thousands of Sheikhs, Ulema and Murids. He is survived by three sons Sayyid Mahmood Ashraf, Sayyid Mohammad Ashraf, Sayyid Hammad Ashraf and one daughter Sayyida Zubaida. Sayyid Izhar Ashraf was the heir of Khanqah Ashrafia Hasania. 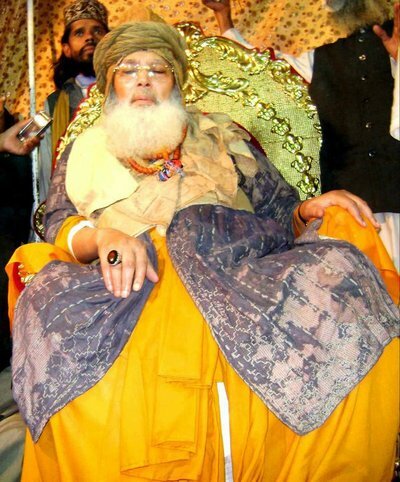 He had become heir of the Khanqah in 1996 after serving it as Wali Ahad Janashin for 47 years. He was said to be the 38th descendant of Prophet Mohammed Sallallahu alayhi wa sallam. He was born to Alhaj Maulana Mufti Sayyid Shah Mukhtar Ashraf and Sayyida Sanjida in 1355 AH (1934) at Kichowcha Sharif. In accordance with the tradition of family, when he attained the age of four years four month and four days, his auspicious Bismillah prayer was performed by his father in a very colorful and spiritual surroundings. Many dignitaries like Hazrat Sayyid Mohammad Mohaddis Azam Hind were present. This ceremony ended with Fatiha and prayer for his perfect knowledge and bright future. As his ancestors, father and grandfather, he started his early education at home and then at Madrasa Ashrafia Kichowcha Sharif. His father took special care of education, as he was to be his Wali Ahad Janashin and after him the spiritual heir of Khanqah e Ashrafia Hasania Sarkar-e-Kalan Kichowcha Sharif. From the very beginning of his education, he was always punctual and attentive to his studies. After completing primary education at Kichowcha Sharif, he was sent to Darul Uloom Ashrafia Mubarakpur Azamgarh, U.P. for higher education of Darse Nezamia, a study curriculum used in a large portion of Islamic religious schools in South Asia. He devoted his full attention to his studies to gain proficiency in every subject of theology. He completed Fazilat in 1959. He was instinctively inclined to teaching work. He first wanted to be well versed in all subjects of theology and then start the work of the famous Sufi Sheikh Sayyid Makhdoom Ashraf's mission. For this he joined Jamia Naimia without salary. He began to teach middle books of Nezamia. But he could not continue it for long, and left teaching work after one year. His father, Maulana Sayyid Shah Mukhtar Ashraf, as head of the Khanqah e Ashrafia Hasania, was facing cases lodged against the Khanqah by the opposite party and above all prorogation of Sufis of the Ashrafia order. Feeling his revered father's loneliness and a number of responsibilities on his weak shoulders, Sayyid Izhar Ashraf left teaching work and stepped in the practical field. His dynamic personalities, his new way of thinking for the development of Sufism and Khanqah highly impressed his father. Seeing his capability and sincerity, he handed over full responsibility of it to him. He developed the Khanqah with lots of construction work for the followers and faithful who would visit it at annual urs celebrations. Sayyid Ashraf had established Madrasa Ashrafia in Khanqah, and his son Sayyid Maulana Ahmad Ashraf wished to make it a parallel in India to the Jamia Azhar of Egypt by naming it Jamia Ashraf. But his premature death left his dream unfulfilled. Sayyid Muhammed Izhar Ashraf convened an educational convention in 1978 in Khanqah e Ashrafia Hasania and presented the programme of Jamia Ashraf. He did not wait for the construction of building for it, the teaching started in the rooms of Khanqah e Ashrafia in 1979. The education started from Fazil class. And over the years it developed into a vast full-fledged university comprising, above all, a huge Mukhtar Ashraf Library and the Ashraf Hussain Museum. He established many madrasas in different places and had been patronizing in order to make these Madrasas central place of Ahle Sunnah Wa Jammah Sunniat and follow the Ashrafia Sufi branch. For example Madrasa Ashrafia Izhar-uloloom Machipur is a famous Madrasa patronized by him and now by Hazrat Maulana Sayyid Mahmood Ashraf Wali Ahad Janashin. 1. Madrasa Mukhtaruloloom Chirayya Chowk Baisi, Purnia. 2. Madrasa Ashrafia Izharuloloom Bahadurganj, Purnia. 3. Madrasa Ahsrafia Izharuloloom Khushamadpura, Maligaon. 4. Madrasa Ashrafia Gulshane Kabir. Bhagalpur. He had deep interest in poetry. A compilation of his Nat, Manquabat and Ghazals has published as Izhare Haqiqat. Sayyid Amin Ahsraf, former reader of English at AMU, wrote in his review of the work: "The creator of Izhare Haqiqat is desirous of knowledge of reality and eager of observation of allegiance of Mustafa Sallallahu alayhi wa sallam. The heart of a Wali as a friend of Allah is a place where there is the truth of the universe. Sheikh e Azam's Naat [Sufi spiritual poetry] is free of excess and deficiency and inconsistent imagination; no conflict with sharia (Revealed law) in his Sufi spiritual poetry and drowned in love of the Prophet Sallallahu alayhi wa sallam."